BRISTOL - The Bristol Eastern girls volleyball team got the season off to a strong start with a straight set victory against Plainville. Aliana Rivoira led the way with seven aces and 26 assists. Amber Blais had 11 aces and Olivia Beaudoin had nine kills. With the win Bristol Eastern is 1-0 and Plainville moved to 0-1. 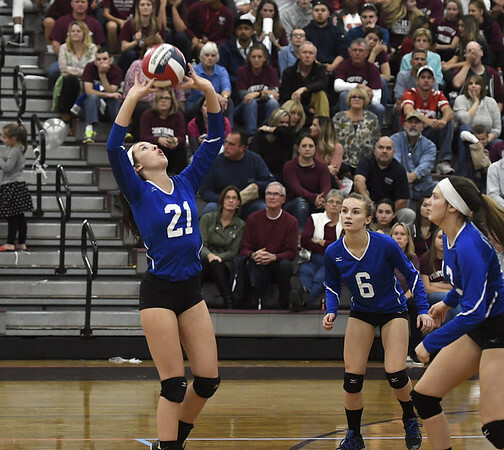 Bristol Central 3, Ellington 0: The Rams got strong performances out of Ashleigh Clark (24 assists, 5 aces), Kathryn Ross (9 kills, 2 blocks) and Emily Ericson (6 kills, 1 block) to get their season started with a straight set victory as well. Plainville 1, Bristol Eastern 0: The Lancers had their opportunities in the first half to score, but couldn’t capitalize on numerous scoring attempts. In the 19th minute of the second half, Plainville’s Mike Torres beat the Bristol Eastern defense and put in a nice goal to the back post. Overall the Lancers were pleased with their defensive performance in the game. “It’s a young team, but we like what we’re seeing and we’re going to get going,” Bristol Eastern assistant coach Bunty Ray said. Nonnewaug 3, Terryville 0: The Kangaroos couldn’t generate any offense and Azria Malloy scored a pair of goals against Terryville starting goalkeeper Allison Drake. Drake stopped 12 shots. With the loss, the Kangaroos fell to 0-1. Woodland 8, St. Paul 1: Woodland’s Aries Bell scored four goals in the first half. With All-State keeper Nina Zwolinski sidelined with an injury, St. Paul turned to Hannah Duffany and Caroline Reardon in goal. Duffany had six saves and Reardon stopped two. Zoey Rubins scored for the Falcons (0-2). Posted in The Bristol Press, Bristol Central, Bristol Eastern, St. Paul, Terryville on Tuesday, 11 September 2018 21:35. Updated: Tuesday, 11 September 2018 21:38.